Our charitable giving committee agreed to a donation of $10,000 to be the Safety Sponsor for The Capital Area Head Start! Some of our folks had the opportunity to visit CAHS classrooms located in Steelton-Highspire Elementary School and read to the children. 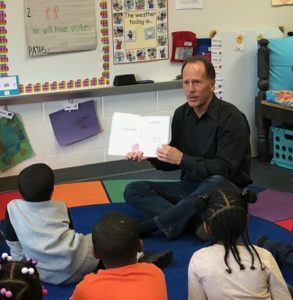 Scott Orndorff, President and CEO, Jeff Pratt, CFO, Courtney Harris, Claims Supervisor, and Katie Gouldner, PR and Marketing Specialist, visited the Capital Area Head Start classrooms to learn how they prepare children and families for success in school and in life. CAHS Executive Director, Jo Vigilante Pepper, explained how CAHS responds to the ever-changing needs of the community by connecting families with local resources that they can continue to use after their child has transitioned to kindergarten. Millers Mutual’s Charitable Giving Committee exists as a dedicated community and industry partner, concentrating resources to have an impact on community development and safety. Millers is conscientious in focusing our resources on areas that speak to who we are, what we do and who we serve. We are in the business of helping to put things back together after the unexpected occurs. Millers supports programs that will help the unexpected be avoided through programs that promote safe choices and protection from hazards that relate to property and casualty insurance, strengthens public awareness and the understanding of insurance.